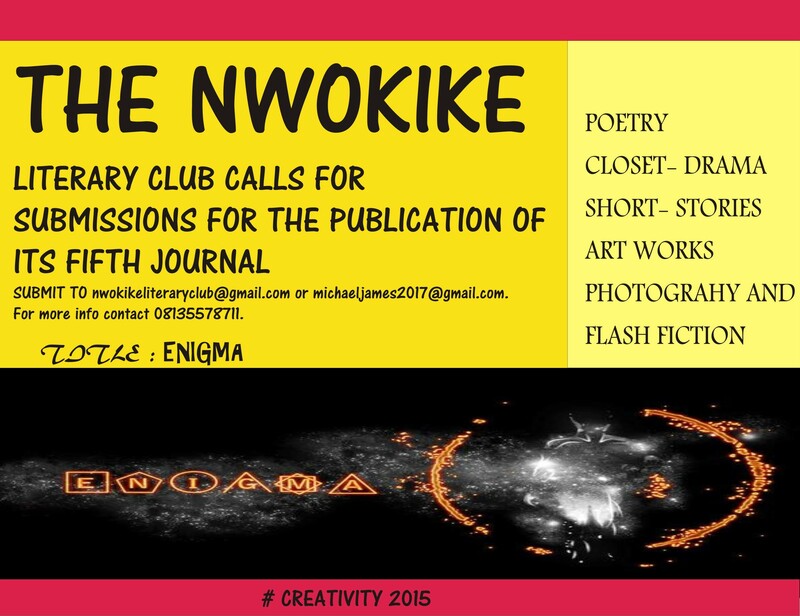 HURRY AND SEND YOUR FLASH FICTION, FICTIN AND NON- FICTION , POETRY AND BLACK AND WHITE PHOTOGRAPHY TO nwokikeliteraryclub@gmail.com or michaeljames2017@gmail.com for publication. The work shall be typed in font 12, times new roman or any other clear and legible font. The work must relate to mysteriousness, be unique in its telling and meet general publishing standards. The work may either be FICTION, NON- FICTION, FLASH FICTION, POETRY , PHOTOGRAPHY AND A CREATIVE ART WORK that is mysterious, illusive or artistically strange.